Complete Performance Chain & Sprocket Kit. Premium "Made in Japan" D. Included in this kit: UPGRADED Strength 525 gearing sizes. 525 Freeway gearing for lower RPM's and higher top speed. This kit will last dramatically longer than oem 520, need adjustment far less often, and get EVEN BETTER GAS MILEAGE. At a much more comfortable highway cruising engine RPM saving wear on your motor and yourself..
15 tooth Front & 43 tooth Rear Sprocket. (c45 high carbon steel, scm415 chromoly steel alloy). The new Pro Street VX 525 x 110 Gold X -Ring drive chain. (Exact fit OEM sizes and gear ratio, or specify Custom sizes). Note: OEM EX650r Ninja comes stock with weaker 520 size chain and sprockets. This kit is an upgrade to the same 525 size that already comes stock on SV650. 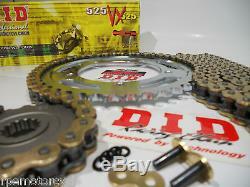 This 525 kit will last much longer than all 520 size kits, especially with this premium DID chain. Also available in optional gear ratios. Call RPE to special order. Chain & sprockets are sent OEM size with Gold DID chain with a RIVET type master link. For even FASTER top speed and even LOWER FREEWAY RPM's, use a 40 or 41t rear sprocket. NOTE: The Faster you make it on top end, the slower you will make it off the line..
For QUCK ACCELERATION kit, you must use 520 sizes chain and sprockets. A 1 tooth change in the front is equivalent to a 3 tooth change in the rear.. EXAMPLE: (-1 tooth front = +3 teeth rear) or (+1 tooth front = -3 teeth rear). Is the same as +4 rear only without changing the front. Stock gearing is the factory calculated "happy medium" of both low end acceleration and top end speed. Complete chain tool for most 520, 525 and 530 standard and o-ring chains. Break, press and rivet your chain with one compact tool. Will rivet hollow nose master links (will not rivet solid soft-nose pins). Will push pin completely through link/side plate. Hardened body, riveting tip and breaker pin for strength and durability. Removable handle for compact storage. Perfect for trail/road tool pack if you have a chain with a rivet master link. Hours: M-F 9-6, Sat 9-5 Pacific Std. JT Sprockets and DID Chain, the leading edge technology in production and materials with total dedication to excellence gives you the ultimate motorcycle sprocket and chain range at unbeatable value. Our mission is to supply you the most innovative and competitive product line fully backed by complete availability and service. Your Absolute Satisfaction is our Commitment with JT Sprockets and DID Chain - World's No. 1 manufacturers of aftermarket motorcycle chain and sprockets, constantly raising the industry's standards in performance, longevity and reliability. The item "KAWASAKI EX650R Ninja DID GOLD CHAIN AND SPROCKET KIT 525 CONVERSION Commuter" is in sale since Monday, June 26, 2017. This item is in the category "eBay Motors\Parts & Accessories\Motorcycle Parts\Drivetrain & Transmission\Other Transmission Parts". The seller is "rpemotorcycle" and is located in Whittier, California. This item can be shipped worldwide.